I hope this message finds each of you doing well. I am writing on behalf of the Georgia Buddhist Vihara to invite you to the next vipassana (mindfulness) meditation retreat and noble day of silence on Saturday, March 30, 2013 from 7:30am to 5pm. This monthly one-day meditation retreat will held at the Georgia Buddhist Vihara(3153 Miller Road, Lithonia, GA 30038). For this retreat, all meditation instructions and discussions will be conducted in English. This retreat is open to everyone....those who are new to meditation as well as those who are experienced meditators. 3:00 pm – 4:30 pm: Sutta Discussion. We will continue our study of the Buddha's teachings found in the Majjhima Nikaya ("Middle Length Discourses") by discussing the Alagaddupama Sutta: The Snake Simile Discourse (Majjhima Nikaya #22). 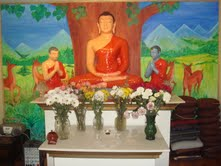 You can find a translation of the text at the Access To Insight website by following this link: http://www.accesstoinsight.org/tipitaka/mn/mn.022.nypo.html Please print out a copy of the sutta and bring it to the Dhamma discussion. 4:30 pm - 5:00 pm: Observance of the Five Precepts and Termination of the Eight Precepts, Buddha Puja, and concluding chanting/dedication of merit. Participants are asked to bring two (2) food items, (1) a light breakfast food (e.g., fruits, bagels, etc.) and (2) a lunch dish (preferably vegetarian) to share with the resident monks and the retreat participants as a form of dana ("offering"). It is also customary to bring flowers, candles, or incense to place on the shrine as an offering. It is customary to wear white clothing when observing the Eight Precepts, though this is not a requirement for attendance. I look forward to seeing you on Saturday, March 30 at the vihara. I would ask that you RSVP (by email) in order to let us know that you will be joining us so we can adequately prepare for those who will be participating in the retreat. To confirm that you are planning on attending the retreat or if you have questions about our program, please feel free to contact me by email (justinhowell2112@gmail.com).